Read the full report here. Read the media release here. We focus in particular on five key factors: education, earnings, homeownership, employment, and health. Disconnected youth, also called “opportunity youth,” are teens and young adults ages 16 to 24 who are neither working nor in school. Given the difference in earnings between the connected and disconnected, Measure of America estimates that the federal government would eventually gain, on average, $11,900 per year in additional tax revenue for each young person who remains connected. That adds up to roughly $55 billion in potential federal revenue gain per year when multiplied by the 4.6 million teenagers and young adults ages 16-24 who are neither in school nor working. 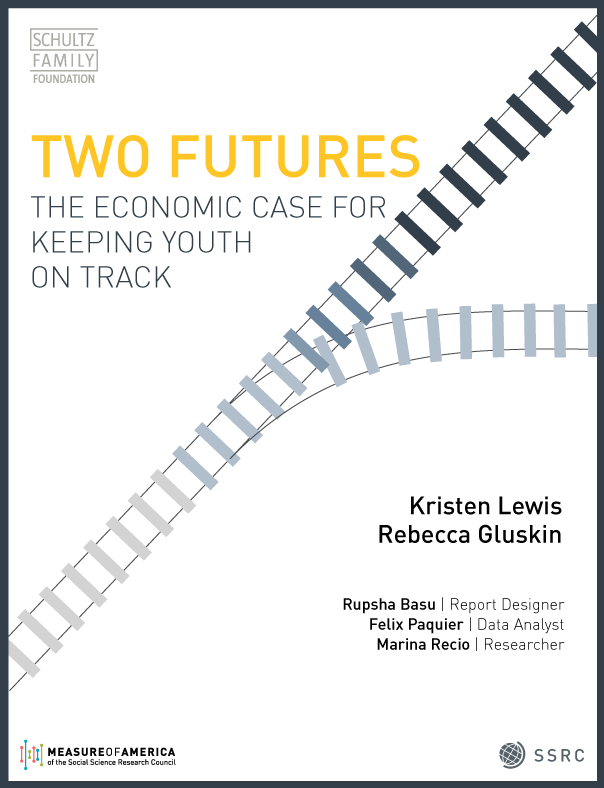 Two Futures also goes further to estimate the potential economic gain of reconnecting young people in four cities—Atlanta, Dallas, Los Angeles, and Washington, DC—factoring in tax revenue, public health and housing assistance, and justice costs. Listen and respond to the views and voices of youth themselves. Support at-risk, first-time workers with training and policies that help them stay employed. Work together across fractured systems. Businesses can support and even spur collective action among schools, the criminal justice system, health-care systems, financial systems, philanthropy, workforce development boards, and others to tackle the unequal conditions of daily life that persist in high-disconnection communities. Set data-driven goals and measure progress toward them.